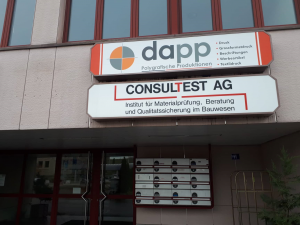 VISIT TO SWISS COMPANY CONSULTEST A.G.
On 10.11. – 13.11. 2018 prof. Jan Kudrna and Ing. Pavel Šperka visited CONSULTEST AG laboratory in Ohringen, Switzerland. During the visit, there were discussions about the research projects dealing with in the AdMaS Road Laboratory. Among other things, they debated the new high-modulus EME asphalt mixtures, which the Swiss experts have a big experience with and which are not used often for the roads in Czech Republic. After the discussion followed a visit to a lab and to buildings where these top asphalt mixes were used. Last but not least, there was an excursion to the FBB plant in Hinwil, one of the most modern plants in Switzerland. The FBB representative made the visitors see it through the entire packaging plant. This plant is completely roofed and the aggregate or recycled material is stored in large roofed landfills, which is unparalleled to anything in Czech Republic. At the same time, it is equipped with a parallel drum, which allows the high proportion of recycled material (so-called R-material) to be delivered to new asphalt mixtures. Based on the experience from Swiss colleagues the visitors realized that there is still a lot to be learned and to be improved in Czech Republic. In conclusion, this foreign journey was very stimulating and brought a lot of new ideas into the projects solved within the AdMaS Center.